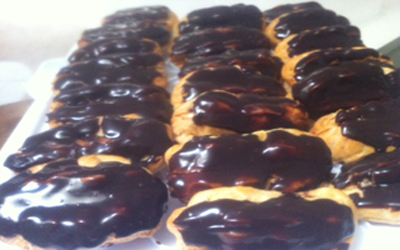 One of the best selling items at the bakery was our eclairs. Made fresh and filled with a great pastry cream filling and topped with chocolate. Add together the butter, sugar, salt and water and bring to a boil in a medium saucepan. Remove from the heat and stir in the flour, stir quickly until the mixture pulls away from the sides of the sauce pan. Transfer the mixture to a electric mixer with a paddle attachment. Mix on low for about 1 minute, raise the speed to medium and continue to mix for 5 minutes, or until the mixture has cooled slightly. Begin to add the eggs one at a time until the batter has formed soft peaks. Prepare an ice bath and set aside, In a medium bowl combine the eggs and 2 tablespoons of sugar. Add the corn starch and flour, mix well. In a medium sauce pan add the milk and remaining 3/4 sugar. Stir over a medium heat until the mixture begins to steam. Whisk in half the egg mixture and stir until smooth. Add that mixture back into the remaining ilk mixture in the sauce pan. Bring the combined mixture to a boil. Make sure you whisk rapidly to prevent scorching. The mixture should thicken, remove from the heat and add in the butter and vanilla extract. Strain into a medium bowl and place into the ice bath, stirring frequently untiled cooled. Place a piece of plastic wrap directly over the mixture to help prevent a skin forming, then refrigerate. Once cooled transfer the pastry cream to an electric mixer and mix with a paddle at a medium speed until smooth. Fill a pastry bag with the pastry cream and a filling tip. Insert into each end of the shells and fill. You can also slice the shells dow the middle and fill from the top.